For 25 years, diabetes slowly eroded the health of retired Indonesian businessman Susanto Salim before he signed up to a catering service last year that provides meals cooked to his specific needs. "I first started as a customer six months ago and when I compared medical examination results before and after, they were actually better," he told Reuters by telephone. Salim is one of 10 million people who live with diabetes in southeast Asia's most populous nation, its health ministry estimates. After stroke and heart disease, diabetes ranks among the top three killers in the country. Diabetes accounted for nearly 100,000 deaths in Indonesia last year, and for 1.5 million deaths globally in 2012, the World Health Organization says. Health experts blame these high rates on poor dietary and lifestyle choices. 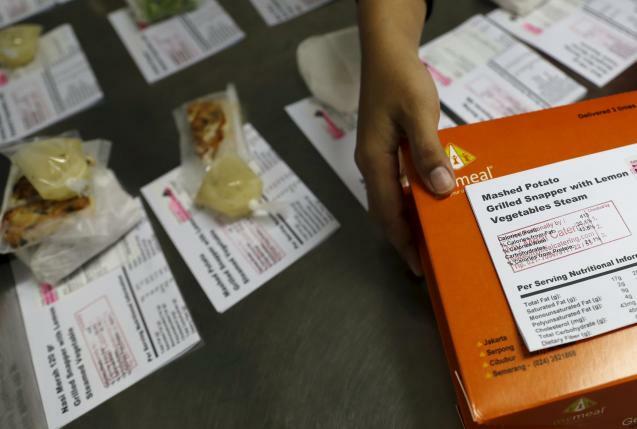 One company has seized on this opportunity: MyMeals, a food delivery service that caters to people with clinical conditions, and has about 250 customers a day in places such as Jakarta, the capital, and the East Java city of Surabaya. "I had hypertension and it was difficult to find any healthy food catering, so I started this business based on my own experience," said founder Ignatius Zaldy, who says a better diet improved his own condition, along with exercise and medicines. "We want to change people's eating patterns," Zaldy said at the company's headquarters, where a handful of cooks prepare and package small portions of vegetables and meat in its kitchen before a fleet of motorcycles speeds them to customers. Zaldy, 44, says the company employs nutritionists to ensure meals are appropriate for victims of heart disease, high cholesterol and hypertension, although nearly a third of customers are diabetics. Still, options such as MyMeals, which costs about 68,000 rupiah ($5.15) for each meal, are a luxury in a country where the World Bank says nearly 40 percent of a population of 250 million lives on around $2 a day. Indonesia now encourages more people to screen for diabetes, so as to spot, and treat, it earlier, health officials say. "But remote areas are a concern," said health expert Sidartawan Soegondo. "Even though there is a public health clinic in all areas, diabetes medication is limited." Yet Salim prefers the expense of catering to the restricted lifestyle his disease forced on him. "My health has been better so far, and I'm even able to go on holiday with my family again," he said.